Purchase your piece of paradise in Palmas Baja on Puerto Rico's south side. It was my parent's retirement home and can be yours for only $80,000 (US). The tropical home has 4 bedrooms, 2 full baths, a living room, dining room and kitchen, and a bonus room. Also featured is a water tank, carport, shed, gated driveway, porch and lush tropical plants. 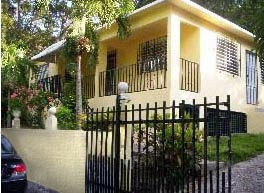 On a quiet dead end street w/mountain views, the home is near the Guamani River, routes 179 and 15, and just 1 mile North of Guayama's famous Plaza Cristóbal Colón, Bellas Arte and Casa Cautiño Museum. Situated close to everything, it's just minutes to Route 52 (Ponce to San Juan), coastal Route 3 and aqua green Caribbean beaches (Arroyo, Patillas, Salinas). For example, EL Legado Golf Resort 3 mi, Jobos Bay Reserve 5mi, Port of Arroyo 5mi, Lake Carite 8mi, Lake Patillas 10mi, Guavate Forest 15mi, Cayey 12mi, Carite Forest Reserve-Blue Water Pool 20mi, Ponce 38mi, City of Humacao 35mi, Tibes 'Taino' Ceremonial Center 40 mi, San Juan 50mi, El Yunque Rainforest 53mi, Fajardo 58mi (and the ferry to Vieques and Culebra), La Parguera EcoTourism Center 60 mi. Interamerican University - Guayama Campus"
EL LEGADO GOLF RESORT "HOME OF CHICHI RODRIGUEZ"
Philly's Joaquin Rivera - R.I.P. It is with great sadness and personal loss that I announce the death of un gran companero de lucha por los derechos de los puertorriquenos en EEUU/a great loss of a brother in the struggle of PRs civil rights Joaquin Rivera. He passed away from a heart attack in Philadelphia. 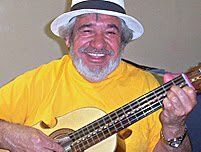 Joaquin was a resident of Philadelphia since 1965 and from a very early age he played guitar. He was a member of the Philadelphia Young Lords, the Puerto Rican Alliance and founding member of the National Congress for PR Rights (NCPRR). He was also the founder and leader of Los Pleneros del Batey, a group that performed around the country and at all NCPRR Convention including in Philadelphia last month. In addition, Joaquin was a counselor at Olney HS where he also was the faculty advisor to the Aspira Club for decades. The PR community has lost a tremendous cultural worker but his legacy will live on. Pray for him and his famly".